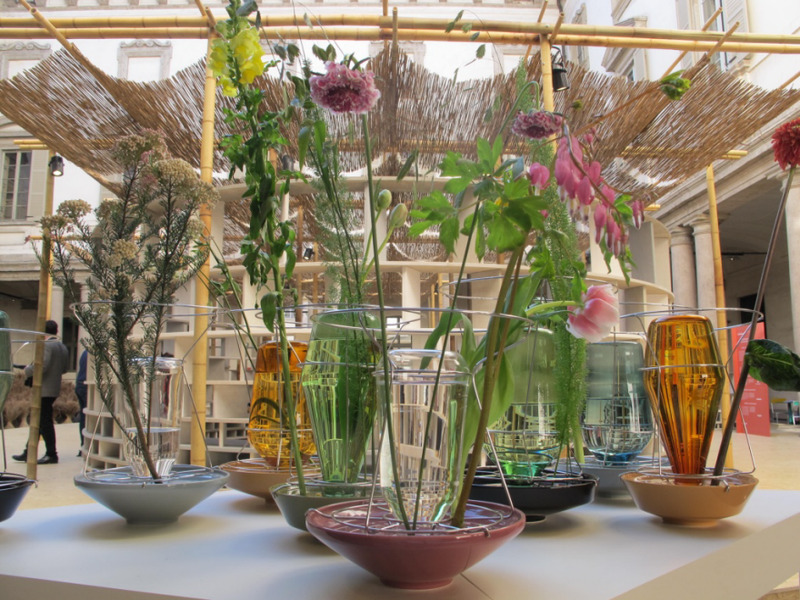 Each day our editors will roundup our favorite sights and projects from Salone Milan Design Week. Inspired by Lexus's early roots in mechanized textile manufacturing, Formafantasma's installation of the Lexus LF-FC concept car is essentially a waterfall of string strategically painted in blue to resemble the automobile's likeness. Lexus: An Encounter with Anticipation is on view April 12-17 at Spazio Lexus-Torneria, Via Tortuna 32. 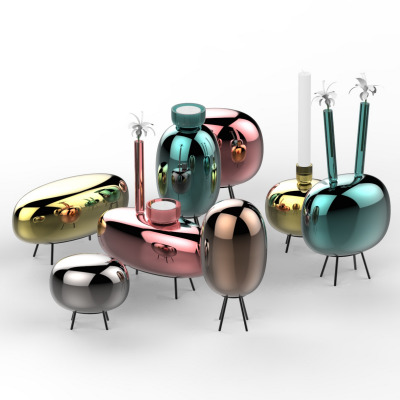 Developed for the Spanish publication The Plant, the jewel-toned glass centerpiece of Chris Kabel's vases give the illusion of functioning as a vessel when in fact, they are drip feeding water into the base of the vase. The wire frames create a silhouette of an archetypal vase while providing support for the stems of the flowers. 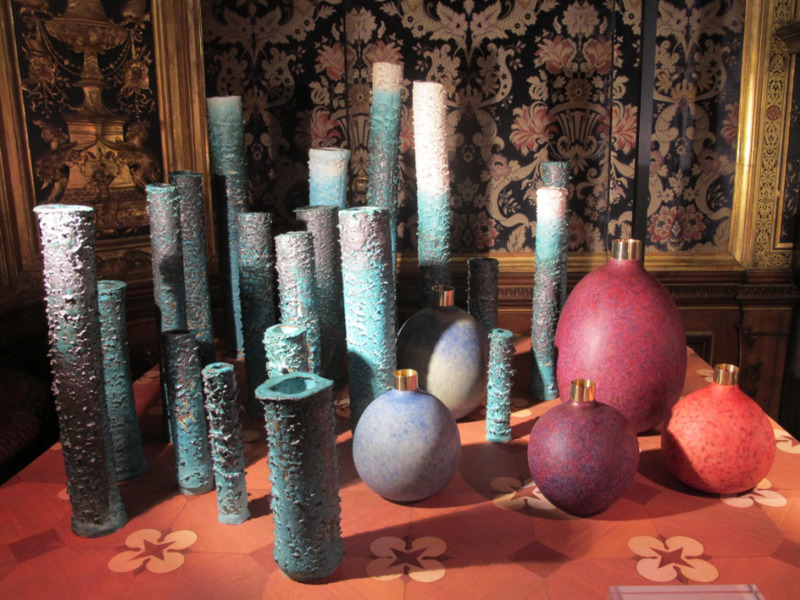 Hidden Vases by Chris Kabel for Valerie Objects is on view April 12-17 at A Matter of Perception, Palazzo Litta, Corso Magenta 24. 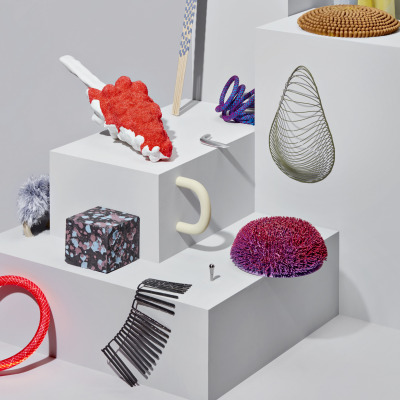 The students at ECAL produced a series consumer electronic prototypes in collaboration with Swiss technology brand Punkt. Our senior editor Rain recently wrote up their retro MP 01 phone designed by Jasper Morrison to do just two things: calls and text messages. 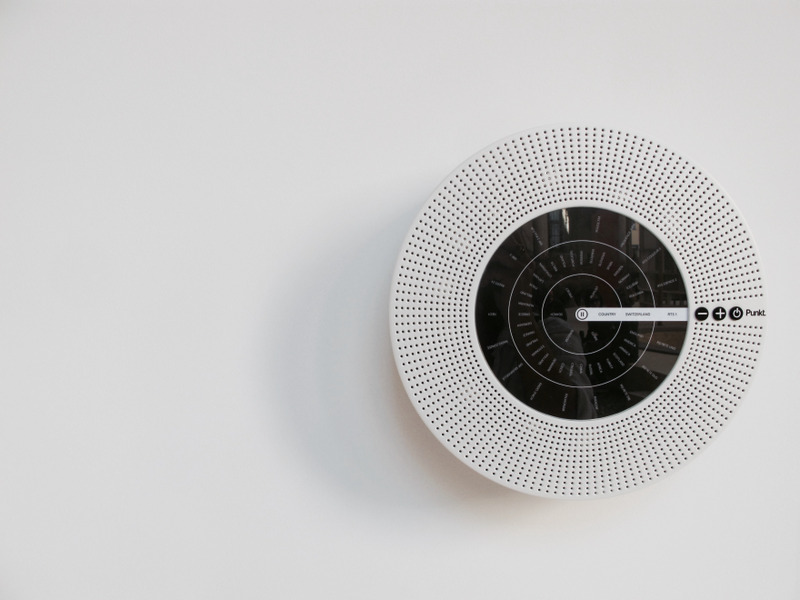 This brand ethos of functional simplicity is explored through the eight projects on show here: a wall clock, digital camera, extension socket, internet radio, flash light, tilting projector, printer and weather station. 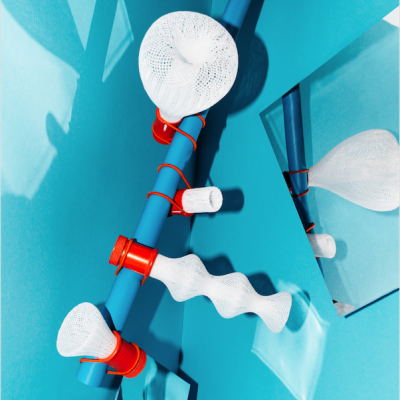 ECAL x Punkt is on view April 12-17 at A Matter of Perception, Palazzo Litta, Corso Magenta 24. When we first saw Damien Gernay's dynamic sculptural forms, it was easy to admire the fluid shape and scale of the pieces (two seen above). But when we realized that the smooth surfaces and imperfect edges were crafted in leather we had to take a second look. Gernay's experiments in leather highlight the beauty of plaster tools. 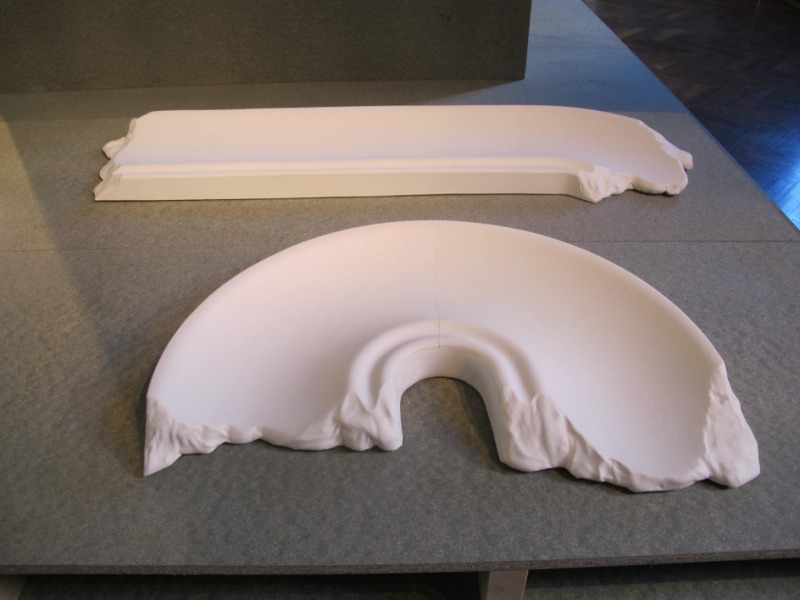 He told Core77, "I wanted to work with one tool to make different shapes...these look simple, like a plate and this traditional tool is used to shape plaster." Gernay worked with gypsum to sculpt the forms and then created resin forms to support the final shape of the sculptures. 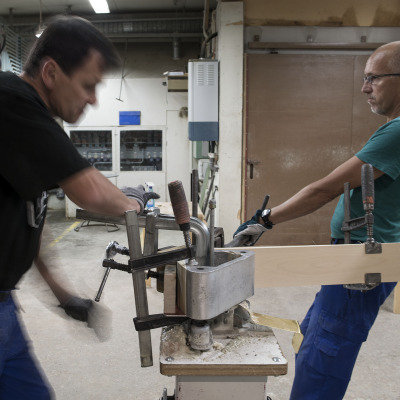 The work is made in collaboration with one of the oldest luxury leather houses in the world—Delvaux—and highlights the artistry and sensuousness of the work and material. Gypsum Disorder by Damien Gernay is part of Belgium is Design, on view April 12-17 at A Matter of Perception, Palazzo Litta, Corso Magenta 24. The magic of Milan is the opportunity to speak with designers in person about their work. 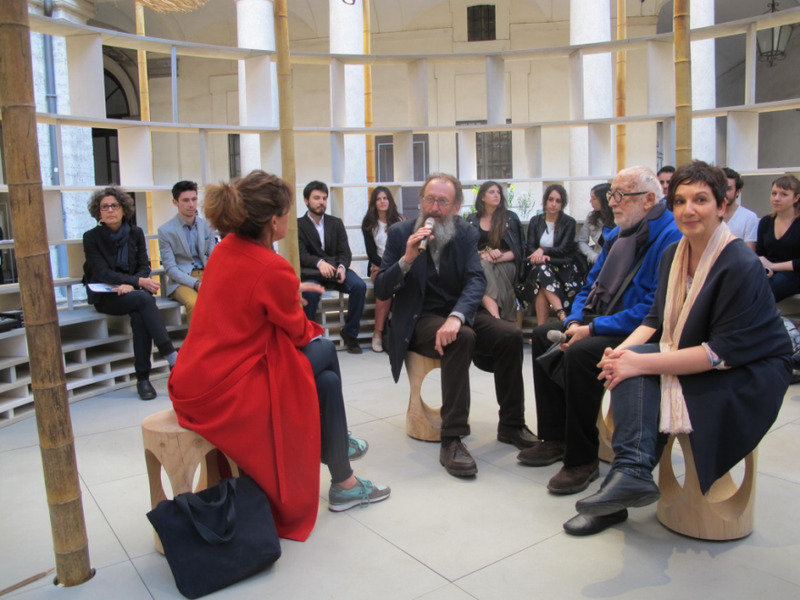 At a special talk in the courtyard of Palazzo Litta, Italian design legends Michele de Lucchi and Andrea Branzi spoke about their work, design education and their exhibition CAOS with the editors of DAMN magazine. See more design talks and interviews April 12-17 at A Matter of Perception, Palazzo Litta, Corso Magenta 24. We're huge fans of Dutch fiber artist Mae Engelgeer's hypnotizing, geometric textiles in a perfect palette of muted colors. 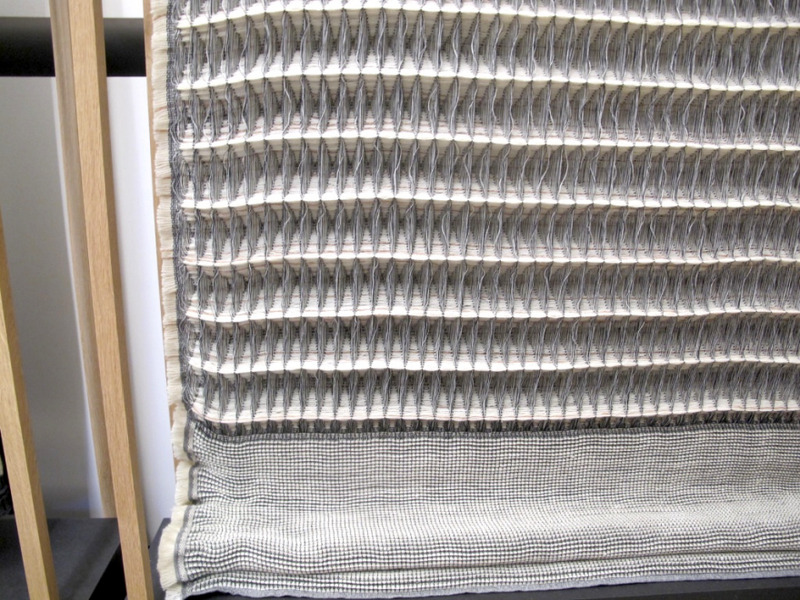 Here she creates architectural panels through a series of large-scale, three-dimensional weavings. The material explorations from this young Dutch duo create otherworldly textures in a rainbow of shapes and colors. Oxidation Aftermath was the graduation project of one of the co-founders Marlies van Putten and shows how the process of oxidation can shape form and color. Their Make&Mold RYB vessels are made with a flexible mold and biodegradable polymers to create bulbous forms of varying weights. Many people gathered today to relax under this kaleidoscopic sight at Superstudio Più, which was a collaborative installation between 3M and architect Stefano Boeri.